I’m not about to offer a radical new approach to triathlon training. 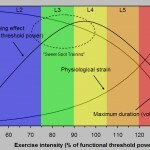 My ‘better’ training week doesn’t incorporate special workouts or enable you to finish an Ironman on five hours a week. For those answers you’ll need to look elsewhere. A season coaching a diverse group of athletes has refined existing ideas; evolutionary not revolutionary. At the micro level sessions remain the same and the build over a season hasn’t hugely changed. It’s the intermediate region – the weekly cycle – where my approach has steadily evolved. Athletes rarely complain that I’ve given them too much. Most of those who seek out a coach are highly motivated and want more, it’s not often I am asked to schedule less. A clear example came while advising an athlete struggling with his performance – he pushed to increase his training load, but results were declining not improving. Life stress was high, training stress was high, breaks were minimal. Sounding a little like over-training the first step was obvious – stop. A period of light training started the turn-around, the more difficult step was developing a plan that worked. The athlete needed to feel he was working hard and progressing, but also needed protecting from simply doing too much. The week needed very defined blocks that he would work through with very defined periods of recovery. The training had to be challenging enough that the rest was required and appreciated. And life stress played a role, like most age groupers he had limited training time midweek, the plan had to be achievable. So a block of intensity during the week and a block focussed more towards volume at the weekend with easier days between them. Three intensive days might be pushing it, but with a clear recovery day following I felt he would push through. Feedback was good, performance started to improve and the schedule was positively received. There was enough work to satisfy that need to push and enough recovery to keep it under control. Two blocks, three days midweek and two at the weekend, the longer block focusing on intensity, the shorter generally for volume work. This structure and focus is partly a matter of convenience, most age group athletes need consistency and a schedule that fits their life. Otherwise duration and focus of blocks can be changed to suit an individual, the important element is the easier day between each block of work. Some athletes aren’t ready for as much intensity in a single block, some don’t need the volume work; the plan is adaptable. My previous training templates offered two variations, either packing the weekend with training or allowing for some free time. The first could contain three easier days per week while the second potentially allowed only one. The newer template provides for two, the exact timings in the week don’t matter as long as they break up the blocks of work. The distinction between an easy day and a hard day is more defined; get it right and the easy day is needed when it comes. It can be motivating, work through the block and you know you get a break. It isn’t for everyone. Some schedules will not match, some athletes find it too intensive and a few don’t need to ease up as much (though I encourage them to work harder within each block). Blocks and easy days vary in focus and intensity between individuals; an easy day doesn’t have to mean doing nothing, I often use them for quality swim work. While it won’t work for everyone it’s become a starting point, a template I’m confident can successfully progress most athletes. It has it’s problems. 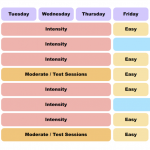 Every key workout in the week should be performed well, this template stacks them against each other – a long run the day after a long bike or a threshold bike session the day after a hard run session. If recovery between sessions isn’t adequate adjustments have to be made. Newer athletes, those recovering from injuries or adapting to new techniques tend to be poor fits, often they need more recovery between sessions. Thoughtlessly and rigidly applied it may not get the best out of an athlete. The intention is to keep taking small steps forward, frequently easing up to ensure a smooth progression. As promised – nothing radical, no short cuts, just refinements following another year. It’s interesting to see how experience adapts my approach, I learn from my athletes and how they respond to their plans. A year from now I may be writing about another new and improved training week.